Two Weeks Notice . .
For most jobs you want to quit, you are advised to give a minimum two weeks notice. It’s considered polite and professional, as it enables both parties to contend with the shifting situation of the working relationship. An employee leaving his or her employment is giving the employer ample time to deal with the change in staffing. And an employer has that time to prepare, to replace, or to alter their staffing needs to accommodate such a change, if necessary. But there is one thing for which two weeks notice already seems too long and much too generous, and that is for a cold! I and other family members have had a cold now for two weeks, as of yesterday. We’re all more-than-ready to give this pesky illness our two weeks notice! Now let me interject first that I am usually never sick! 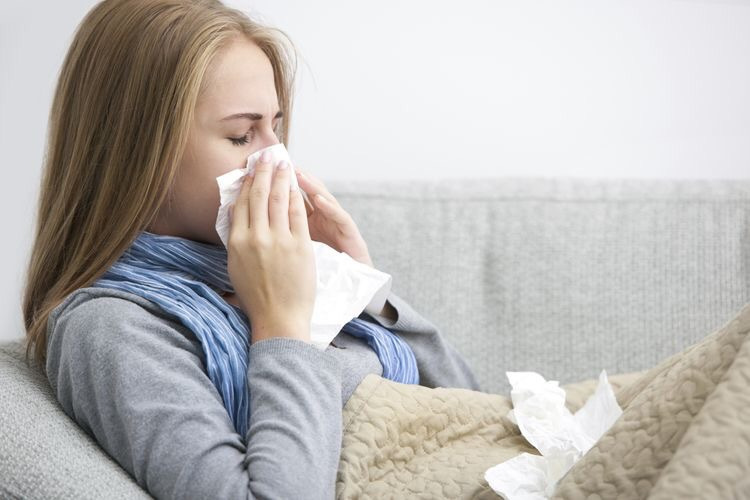 I haven’t had a cold or any communicable illness for several years now. I don’t suffer from allergies, and I have a fairly strong immune system. But somehow, I brought this pesky and brutally persistent cold into this house. It could have been accidental contact with a “carrier”, and after the past two weeks, I would be prone to consider anyone who passed this beast on as such, HAHA! It could have been that I brought this on myself by working so hard in my garden in early April, preparing the landscape for the new warmer season ahead. For two weeks, I pruned, raked, swept, removed, and amended the landscape after Winter’s wear and tear. Perhaps something I breathed in during a profuse blooming season such as this one, or just the daily act of breathing in dust and spores firsthand, left me susceptible to spores, germs, or whatnot! However it came to pass, I can assure you this cold has worn out its welcome by now! For two solid weeks, I have done nothing much more than cough, sneeze, blow, rest and whine. And my family members have been my echoes in those activities! There isn’t much more we have felt like doing, even missing our Easter Sunday planned activities, and now we have passed the point of being tolerant of this forced schedule any longer. We didn’t want to spread this to others, so we endeavored to do as little as possible with our healthy friends, family, and strangers. I admit readily that I am a most impatient patient! In fact, my family members and I have often discussed this particular version of the cold, pondering how we could be so done in by it. We’ve wondered if it is the gift that will keep on giving much longer, as we’ve had enough of all the symptoms and the remedies! But we have also pondered how those with chronic illness persist over time, enduring what they must with patience. This last two-week period with this cold has taught me to be immensely grateful for being so healthy usually, and to not take that normal state for granted ever! It has reminded me how wonderful it is to feel good! And of course, it has given me a whole new level of empathy and sympathy for those who must contend with health concerns far scarier, more intense, and more physically devastating than a cold! 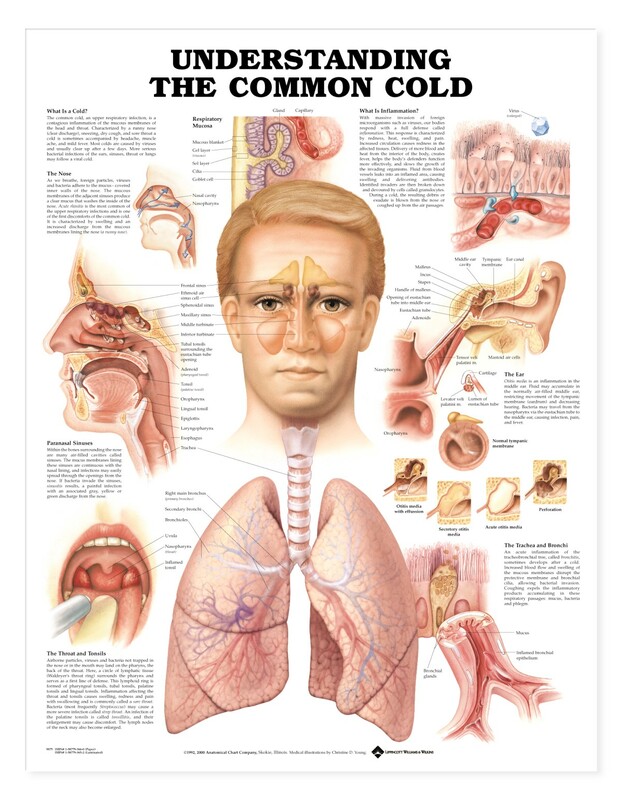 After all, in the grand scheme of things, a cold is relatively minor and we can envision the foreseeable future without it! But officially, I have given this cold my two weeks notice! I want to sever our ties, and break free from its hold upon my body and my life once and for all. I have things to do, places to go … well, you know the story! Two weeks just seems like long enough for a pesky cold with all its attending details. I don’t want to blow my nose, cough, take medicine or rest any longer. Time to move on, and I’ve given it enough time in all fairness. We all have! Since I gave this beast to my family members, as I was clearly the first one sick, I have also endured the guilt and shame of having passed such a monster to them! My mother, who also got sick while fussing over me, has proclaimed this the worst cold she has ever endured! Now surely giving your elderly mother such a beast as this is not something in which a daughter can be proud?! Today’s the day, it’s two weeks later, I’m moving on and so are the members of my family. We’re severing our ties with this particular virus! Adios, au revoir, auf wiedersehen and a big ciao to this two-week lesson in patient endurance! We’re surely saying our goodbyes with our renewed gratitude and our heightened empathy, lessons learned from our pesky “teacher”. A Banner Year . . This is truly a banner year for plants blooming! I found two plants in my yard today which haven’t bloomed in a really long time or ever. The joy in seeing something finally blooming which isn’t a common bloomer is significant. It took a patient mind, heart, and soul to wait for those plants to bloom! A gardener has to be patient though, for gardening is rife with uncontrollable uncertainties and living matter, including plants, has plentiful imperfections. The lifespan of plants isn’t really in our control, though we like to think we have a significant part in the health and well-being of our plants! There are weather extremes, irregular rainfall, disease and pest problems to worry about. Each day and every season bring new challenges, especially in a harsh desert environment like this! 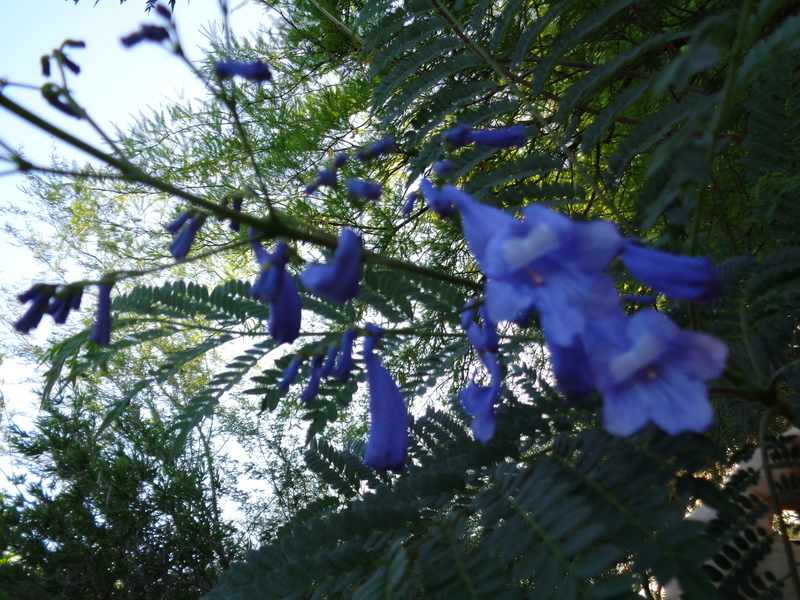 One of those plants blooming this Spring after a long period sans blooms is my Jacaranda tree, which just a few years after planting, suffered from a Winter of several touches of hard frost, requiring that it had to be severely cut back. After a slow, prolonged renewal, that Jacaranda is blooming once again! When I noticed the vibrant purple blooms, I ran outside to get a few photos. It’s been something I waited a long time to see, with hopeful expectancy! And this morning, there they were, glorious purple trumpet-shaped flowers in clusters upon several branches! For me, those blooms were answered prayers! That Jacaranda tree is one of my favorites, and I truly had to endure several years of waiting to see its beauty renewed. My patience was rewarded today for sure. Another plant which is beginning to bloom today is a variegated Duranta which had never bloomed before. The foliage is stellar, the plant has been thriving and growing like gangbusters, but there were never any blooms prior to now! I’m not sure why this variety has never bloomed before. 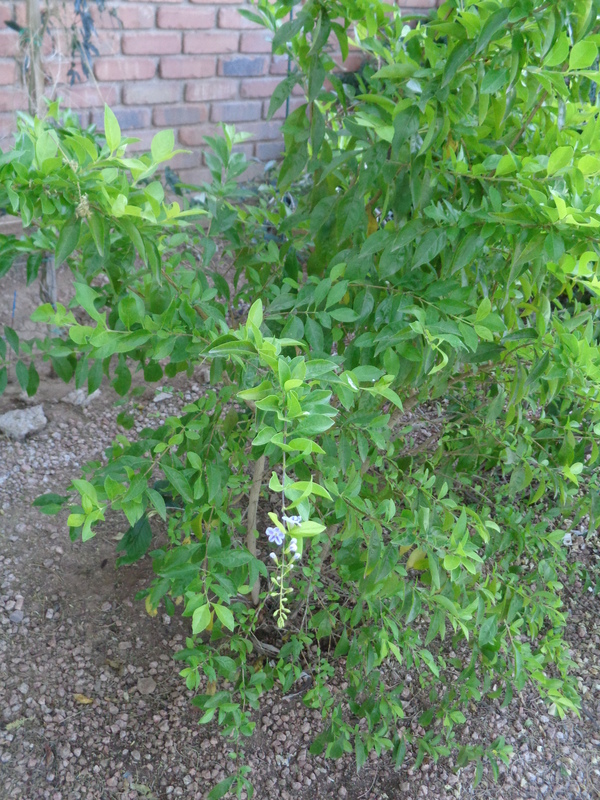 I have other Durantas which have bloomed every year and even several times a year. But I didn’t mind, as the foliage and shape of the plant have been very pleasing over the years. I almost forgot what the plant’s flowers were supposed to look like. But seeing the buds opening up now, I realize that the flowers of this variety are as special as the unique foliage! The smaller purple flowers on Wisteria-like clumps have white ruffled edges in this cultivar! I am so joyful after years of waiting to finally see this plant fulfilling all the expectations I surely had when I purchased it. Earlier this Spring, I wandered around my garden and took photos of whatever was blooming! I did that again today, although a lot of different plants are now showing off instead of the plants which had been a month or so ago. This has been a truly rewarding Spring for beauty, fragrance, and variety in desert gardens so impacted by significant Winter rainfall and now, seasonal warmth. Things are bursting with life and most landscapes around the city, both man-made and natural, are filled with flowers, flowering shrubs, and trees heavy-laden with blooms! It’s absolutely beautiful! Each new day is surprisingly promising for my landscape’s evolving beauty. And I take great joy in witnessing each and every beautiful transformation unfolding, especially those which required a bit of my patience to behold! Yesterday was another idyllic day in my garden, like paradise or Eden! In the morning, I awoke and opened the window coverings as I usually do to reveal all sorts of creatures doing what they were created specifically to do! There were bunnies, including two fairly brand new baby bunnies so tiny and cute! 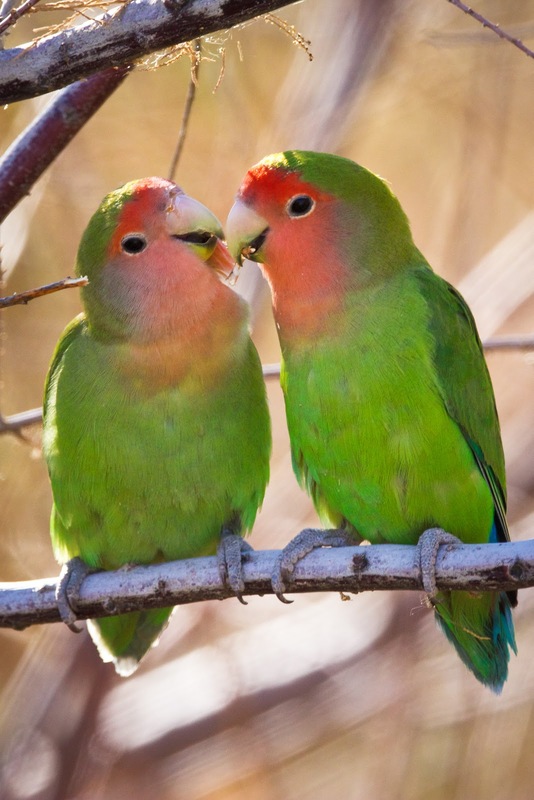 There were bright, lime green lovebirds, donned in their accent colors of red and turquoise, with their peach faces. Other birds, including quail and regular desert nesters such as wrens, robins, doves, and the small yellow finches were too numerous to count! Then there were the flitting hummingbirds, buzzing about with seeming effortless ability from bloom to bloom! All these residents and more were seen amidst the backdrop of flowers and blooming plants galore! 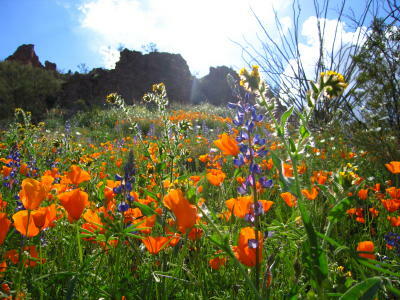 It is truly a prolonged Spring of beauty, wonder, and abundance in a desert garden. In watching all this life unfold, I couldn’t help but be drawn into a silent, secret observer’s role! That role requires quiet acquiescence to the living creatures just doing what comes naturally to them. My direct interference would have silenced them all, they would have scurried off to hide had I been out there among them! But in quietly watching from the windows of various rooms, especially during the active cooler morning and evening hours when the sun isn’t so intense, I am able to witness all the wonders of their lives play out before my own eyes. And it’s magical! I’m often out there with the various creatures doing my outside chores and watering my plants, but to truly witness their antics, I must watch them from the other side of the glass, within my house. I wonder how many others would notice the fledgling dove’s efforts, uncertain in its own abilities, trying to take a drink while perched on the side of a water feature near my front porch? Would others also feel such joy for the young dove having conquered the physical limits of the container’s rim, finding an ease in drinking from the rocks sitting lower into the water? Maybe such joy is my natural reaction because I placed that water feature in my yard, as well as several others, specifically to draw such creatures and to accommodate their water needs during our intense dry, hot Summer. I keep the water levels high, the containers clean and filled just so the birds and other animals needing a drink will find water easily and readily within my yard as they need it. Their presence in my garden brings me such joy, that it surely is worth any bother or effort! Nature is wondrous and magical! 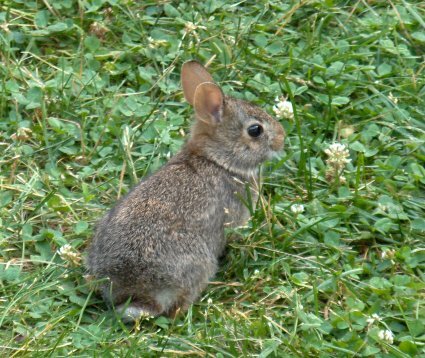 The many bunnies in my yard are often pests, but the first time I lay eyes on the new season’s crop of baby bunnies, I forget the ravenous desires they will have for all my specialty plants as they grow and develop! It’s a delight to give all the players in this life’s performance their freedom and access to my garden as part of my care and responsibility for it. I plant knowing that things will be nibbled away. I rake around the freshly dug out burrows. I water with the awareness that I’m nurturing not only plants but the animals which nest and feed upon them. I feel a responsibility towards keeping up with the needs of all those creatures, even though they don’t belong to me, they aren’t mine nor are the wild creatures my pets. I’m merely assisting in their care and feeding while enjoying infinite, idyllic moments with them each new day! And it’s a welcome gift from God each new day I pull back the window coverings, which I perceive as a reward for helping to create such an Eden in my own yard! The Gift That Keeps Giving . .
Patience is the lesson learned through many of life’s complications, trivial and more serious! It’s the realization that you’ll have to tolerate what at the time and at the moment seems intolerable, even if only for a short time! Patience is a fruit of our Spirit, found within us naturally, but surely requiring lessons and purposeful attention to developing! Patience convinces us to remain calm, to stay peaceful within, to consider situations purposefully, and to not react without first thinking things through. 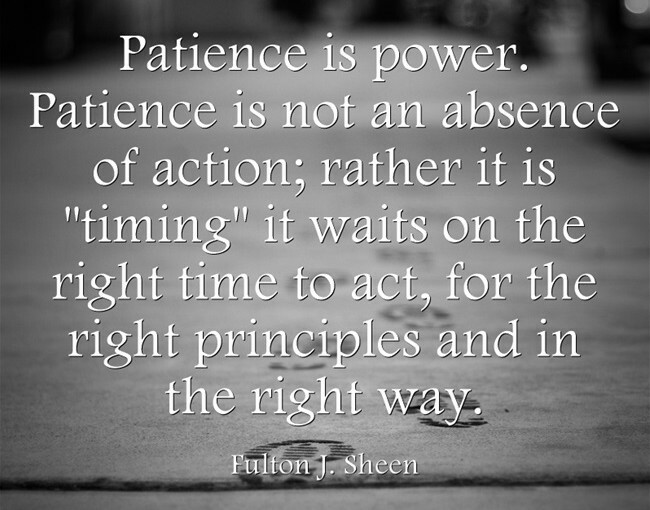 Patience accepts flaws and tolerates the imperfections of human nature and life itself! I try not to measure my patience or lack there of! As soon as I crow about my patience through something, it will invariably bring on a challenge or test which causes me to eat my words! I think God teaches us in the middle of our trials so that we know it’s not of our doing, but His! And if I am ever actually sufficient in patience, I will surely know that it is God’s handiwork in my life. It surely wouldn’t be all my doing! I still struggle, daily! This past week, while finishing up the pruning and trimming of some trees in my yard, trying to clean up after Winter in preparation for Summer ahead, I was attacked by tiny black ants biting my feet! I was actually doing the last few things on my list early one morning when it occurred. The attack was annoying at the moment, but I brushed the pesky ants off and continued my work until I could get out of their reach. It wasn’t until later on, and especially in days to come, that I paid attention to the effects of their foray with my feet! The bites I received became highly sensitive to itching whenever they were touched or even brushed against. And if I actually forgot about the bites while half-asleep, scratching my feet mindlessly, I set off a terrible itch almost instantly! It was so annoying to suffer the side effect from that one brief moment in the yard for several days afterward. Even anti-itch creams took their sweet time to work on the seven or so inflamed spots on both my feet! Finally, the itching passed, after a few tedious days. But the whole event felt like the gift that keeps on giving for that time! That is the hard thing about being patient, it requires strength and perseverance over a set of circumstances which usually are not all that pleasant or fun, much less something we’ve chosen! Much like the bites on my feet, the event itself was not much fun, and the continued itch was surely unpleasant! Patience was required if I didn’t want to drive myself insane! Now, not all tests of our patience are so trivial. Not all tests are so short-term or so inconsequential to our lives overall. We often have to endure lengthy ordeals which eat away at our ability to stay the course! Emotions are usually the reason for waning patience! We just hate to endure what we don’t want to. And any discomfort, any pain, anything through which we process negative emotions, are the attacks we wage on our own fledgling patience muscles! We fight a barrage of emotions and feelings which encourage us to abandon our budding patience in favor of having what we what now, rather than enduring what we find difficult or even impossible! Patience is always a test of our will, our emotions giving way against our determination to persist with maturity against our own emotions! To be able to control one’s own emotions is a sign of maturity, as then one has more dominion over self! The more emotionally immature we are, the more reactionary we tend to be and thus, unable to stand strong against whatever our emotions dictate. Comfort, ease, need, desire, fear, insecurity and many other internal drives play upon our emotions. We hate to be uncomfortable, to feel deprived, to have unmet needs, or to suffer for any length of time! And so, we settle for less, choose an alternative, or give up on what we’re pursuing rather than patiently forge ahead. Patience it is said is a virtue. 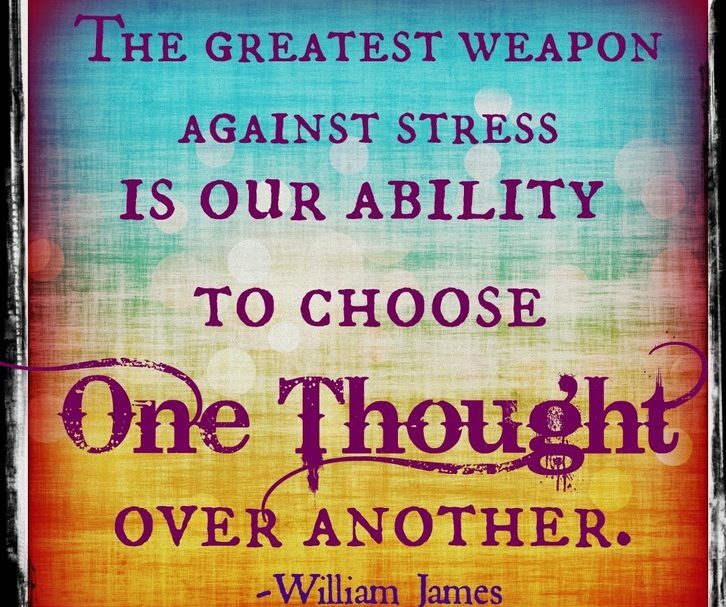 It can protect us from emotional contests, willful battles, and serious mistakes which take us off course. Patience leads to more civility amongst people and prospers respect for others. It is only through our patience that we learn to be humble, to tolerate others, and to wait for what is truly meant to be ours. 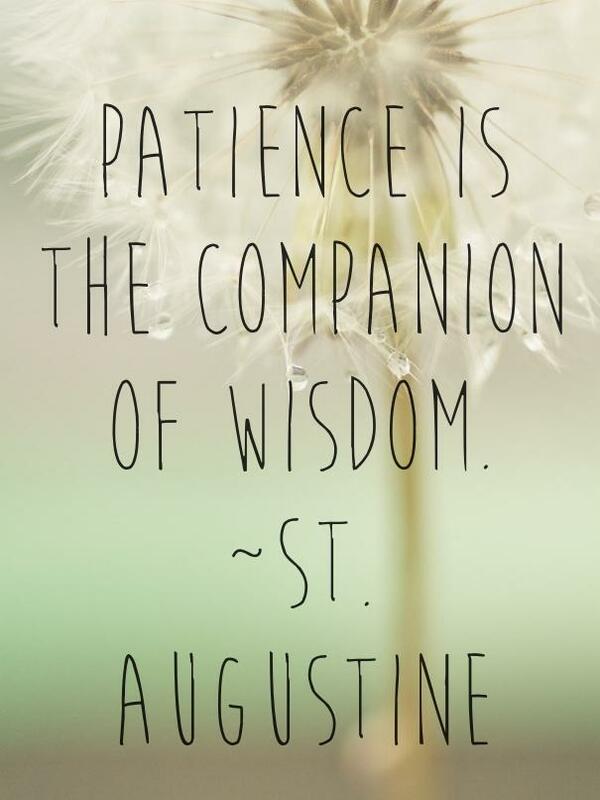 Patience is one of the fruits of the Spirit because it enables us to deal with one another with more loving kindness and better reason, as each of us is unique and independent, it gives us more measured concern. It is required in life to keep us from falling into bad habits, from making hasty erroneous judgments, and from reacting without forethought. And most of all, patience teaches us the art of self-control, self-discipline, and self-acceptance, as our flaws and failings are a natural part of the human experience. And the more patient we are with our own flaws, the more patient we are with those of others! Now, if I could just be patient about ant bites and other buggy assaults! The Weight of All That Love . . I just saw a really timely movie for this season of Easter. 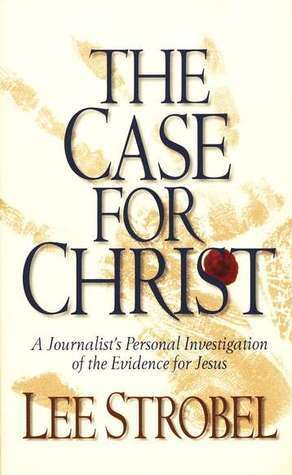 It’s called, “A Case For Christ”, based on a book written by the former atheist, Lee Strobel. I won’t give the plot of the movie away, although the book has been available over many years now and is probably familiar to many of you. It’s basically an accounting of what the title suggests, an investigative reporter’s discovery and evidentiary investigation into the truth about Jesus Christ. Based on leads, evidence and by following the story wherever it takes him, Mr. Strobel endeavors to discover a way to disprove and discredit what is revealed in the New Testament Gospels once and for all! But suffice it to say, it doesn’t go as planned! As a believer, this story of Strobel’s probing investigation is a great reminder of God’s omniscience and the amazing gift of love He gave the world through the birth, life, and crucifixion of Jesus. When I was younger and attending church routinely by habit, I understood and processed the events of the life and death of Jesus upon that cross to a limited extent. But it has only been through a process of spiritual growth and a great desire to draw nearer in relationship to Jesus by choice, that I have come to truly appreciate the overwhelming sacrifice that He made! It was something which was often softened and sanitized for the sake of us believers. We knew He went to the cross, but we couldn’t truly grasp what He actually physically endured until recent years when the reality of it all was more truthfully and graphically depicted on movie screens through films such as “The Passion of The Christ” and in this one, by way of explanation. To understand the physical impact of scourging and crucifixion upon human flesh is to realize the tremendous and undeniable sacrifice Christ chose to make for us all! When we really allow ourselves to contemplate that horrific physical suffering which was necessary as a blood atonement for the redemption of sin for all time from all beings, it is truly beyond our scope of thought. Pause and contemplate that unimaginable sacrifice, it will probably make your soft heart ache for the sake of such love! And that physical suffering is a great part of the proof which finally converted a reticent and stubborn atheist in Strobel. He had surely grown up hearing a sanitized version of the crucifixion as a child before he chose to avidly deny God’s existence in adulthood. But in its actual detail, beyond horrific to imagine, the physical reality of the crucifixion is the telltale evidence of not only the absolute truth of Jesus’ resurrection but also of God’s infinite love. It is only a Divine being which could possibly overcome death endured upon the cross! For those who still choose to deny it, it is not compelling enough to sway their hearts hardened by disbelief and denial, but for hearts willing to ponder such an unselfish act of love, it is undeniable and indisputable! For believers, who need no additional evidence of the proof of His existence, their faith is enough because God’s love is all they ever needed as proof! 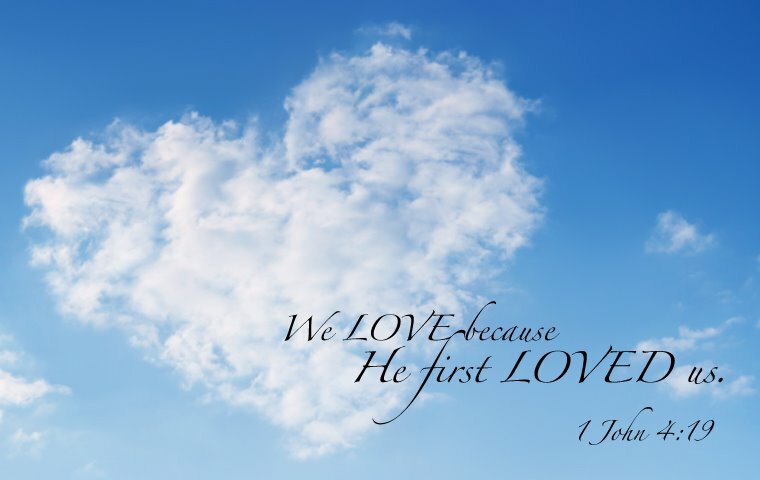 Once you know His love within, there is no need to be further convinced of His existence. You know because you know! That love lives within you, changing your heart and life forever! It doesn’t make you perfect, or better than others, it just makes you different from who you were before! Easter is the day we remember that infinite, defining and amazing gift of God’s love! The day when Christ willingly subjected Himself to ridicule, betrayal, torture, false accusations and ultimately, death upon the cross, is the most meaningful day for believers! 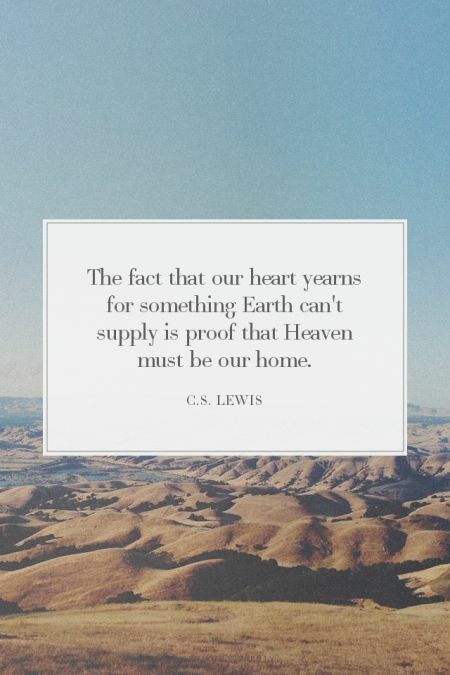 It’s proof that God so loved the world, that He was willing to spare us all the relentless condemnation of our sinful nature, of an eternity, spent apart from Him. By sacrificing His one and only beloved Son for our sake, as the Gospels and history recount, God remedied for all time the constant need for us to endeavor to atone for our sin through blood sacrifices. We ourselves could never be good enough to bridge that sinful chasm which separates us from God, we’re always sinful by nature. So Jesus bore the brunt of all our sin for all time, the truly innocent and pure lamb, the blood sacrifice slaughtered for the sake of all of us so that we would no longer be separated from our Father! Jesus is the bridge over the chasm! And my heart aches from the weight of all that love, when I contemplate such a sacrifice for my sake and what it means for my eternity! A “Live and Let Live” Technophobe . . I clearly have one foot in the 21st century, and one foot securely in the stone age! I am a self-described technophobe. I love technology but I hate it! And so I am constantly in conflict with the driving force of innovation for our world! What am I to do when I cannot keep pace with technology because I never really have an ease about it, a clear foothold in it, and an ever-present reticence towards it?! I have an older phone, which isn’t smart. I have a simple computer network, with simple programs. I have learned what I know by using what I have but I haven’t kept up with the growth spurts of technology. I’m never in line waiting for the newest phone. I’m not interested in having a watch which does more than keep time. I like using an actual camera, even though I have the ability to take pictures on my old-school phone. And I’m content with basics when it comes to electronics because it usually means I can at least attempt to handle issues when they arise. I guess that’s the key, I have only ridden the technological wave so far without any motivation to find its leading edge! One time several years ago I recall hearing my siblings discussing their current technology for a few minutes, I presume it was about their smartphones or tablets. To me, listening within earshot, it sounded as if they were speaking in a foreign language! I couldn’t keep up with their discussion, as I didn’t know the meaning or reference of many of the words they were using! It really sounded like jibberish to my untrained ears. I am sure they were making salient and valid points, but they might as well been speaking in a foreign language. And I try not to enviously observe children these days, who clearly have an advanced ability and understanding about technology, years and generations ahead of mine! When I was more active on social media than I have been of late, I would often read posts about someone’s challenges with their present level of technology and wonder to what they were referring! I’m not a simpleton, I am highly educated and consider myself a quick study. But with technology, the terminology is so specific that unless you have a point of reference in which to tether yourself, you can easily be left behind! And unless you have a job or some motivation to have the latest, newest, or most advanced, you can easily be left behind! Since I am self-employed, I don’t rely on a company influencing my usage on the job. Because I am not particularly materialistic, I cannot foresee a time when I will stand in line a day or two in advance of some new gizmo’s release. I suppose I am comfortable with what I have even though I might be assuring my place in the prehistoric technological community! At least I’m not such a technophobe that I am anti-technology or paranoid about the rapid course of technological advancement in our society! I’m definitely a “live and let live” technophobe, even as I watch the ever-advancing wave of technology leave me in its wake! A Fissure of Interference . . Sometimes in life, we’re waiting for the approval or acceptance of others just to proceed. We give others a lot of weight in our lives via that choice to garner another’s approval and acceptance before we act or speak! By waiting on that opinion of another, we often water down our own talent, point of view, or performance accordingly. We become addicted to the verification which another person’s positive feedback, approval, and acceptance of our actions, words, thoughts, or beliefs provide. We often need that before we do what we think we should, what we’re compelled to do! Instinctively, we often know what we should do. We have talents, skills, dreams and ambitions which motivate our actions. But when we filter those internal drives through the perspective, experience, intellect and understanding of others, we create a fissure of interference for our own success! We don’t need others to tell us we’re able, we’re good enough, we’re talented, or that we’re going to succeed at something! What we really need more than an opinion, a nod of approval or an avowed acceptance from another, is our own confident assurance in what we’re doing, saying, thinking, and believing! When we care too much what others think regarding our lives, we give away our own power to act and we become increasingly more insecure about ourselves! Wanting approval or being tied to getting acceptance from others is alright if we aren’t relying upon it. If it’s the icing on our cake of already believing in ourselves and feeling secure in our thoughts, actions, speech and behavior, then it’s more than okay! 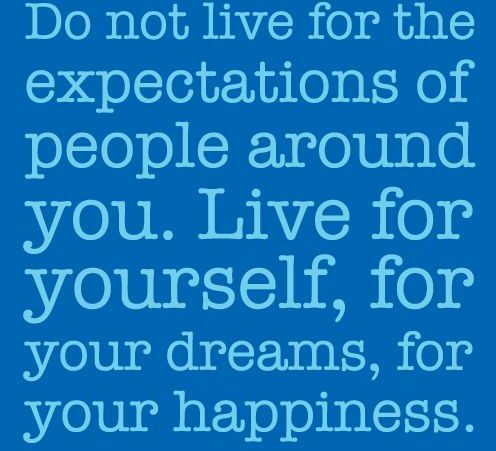 Especially if it comes in the form of compliments and affirmations of our successes! But if getting approval is our usual way of knowing we can proceed or that we should do something, then it’s just a reflection of our insecurity. We need to know how to do, to say, to be, to think, and to feel independent of others injecting their opinions, beliefs, and dreams into the mix! 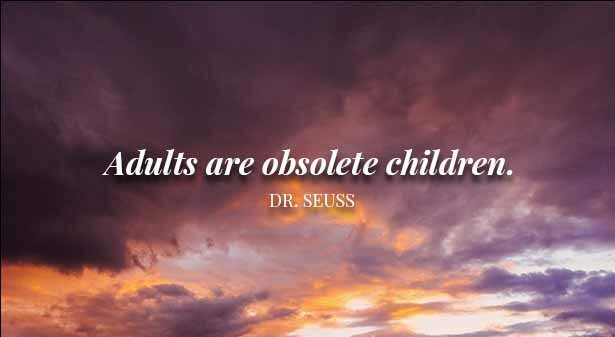 We are unique individuals, which makes it impossible for others to successfully step into our shoes, to know what is best for us in any regard. It is up to us to make the choices, to step forward into the unknown, that each new day represents, with confidence and self-assurance. We must accept the reality that we’ll win some and we’ll lose some, that we’ll be successful and that we’ll fail, as well as that we’re responsible for the way our lives turn out! When we’re children, others step in to make the decisions which we cannot, but when we reach adulthood, it’s up to us to securely accept the role of the manager of our own lives. Insecurity is the inner voice which screams, “I’m not ready!” or “Not yet!” or “Should I?”. Insecurity is what blocks us when we endeavor to pursue our dreams. It is the inner force which gives others more credibility when estimating our abilities or our success. It’s the inability to act unless or until others give us their permission or confirm our preparedness or state of readiness. What a terrible way to live, needing others to give us what we should be able to garner from within! If only we would believe in ourselves and give to ourselves the same level of credibility we seem to easily give to others! Learning to rely upon our own instincts, to accept responsibility for our own successes and failures, as well as being eager about the personal growth we’ll experience when we do is key. It’s often seemingly easier to give others the burden of our choices in life, as perhaps it will take the onus of accountability from our own shoulders if we do! But in letting others lead us in our own lives, we also miss all the opportunities we have for character development and for reaping the personal rewards of creating success! Step in eagerly as manager of your own life, in doing so, you will have to accept many things which aren’t perfect, all the failings which result from your own choices, and the burden of regret when things don’t go as you hope. But you also get the successes! You’ll get the esteem-building, confidence-affirming realization that you met the challenge, reached new heights, took a daring step, achieved a dream, and grew more in the process! A Seasonal Wardrobe Change . . I feel sorry for allergy sufferers during a desert Spring such as this one! There are many stuffed up noses and tear-filled eyes with all the flowers and plants in bloom. It seems as though even normal blooming has been surpassed by super blooming this year! We’ve had regular rains since last Summer all throughout the desert Southwest, usually of a significant amount every month and then we had our usual warm up to prompt seeds to sprout and plants to grow. Now we’re in our glory here in the desert! 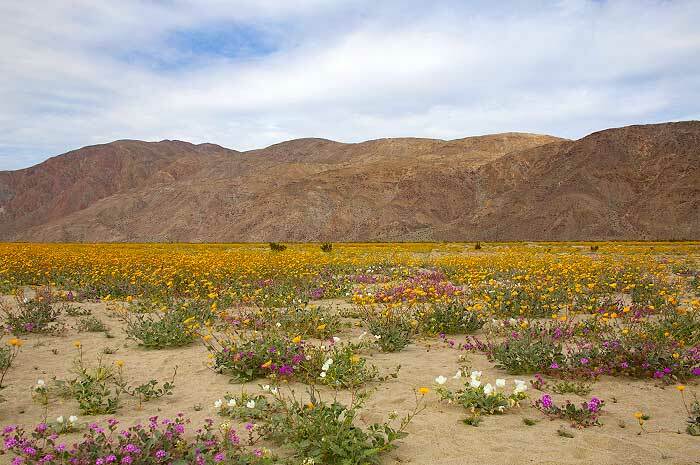 Like fresh carpets or blankets spread over entire regions, or new Spring dresses adorned to highlight the season, this desert is covered with wildflowers and shrubs blooming en masse! I recently drove through the desert between Southern California and Arizona. Along the Interstate, the normally drab and boring desert through which I’ve passed dozens of times on that drive was transformed by a carpet of fiery gold! Everywhere I looked, including up the sides of mountains and beyond, were yellows and orangy-gold flowers illuminating the ground! Brittlebush, poppies and other yellow blooming plants were mixed with a few purple and white wildflowers alongside the highway and beyond to cast a more vibrant costume change over the usual beige dress worn by this familiar desert. But I know all this color and beauty comes with a price for so many! They endure allergies daily. I consider myself quite fortunate to not have such issues, as I love being outdoors gardening. Anyone inclined to allergies would have significant trouble this year! What a burden to have to choose between viewing and being amidst the beautiful blooms out in the desert or to sit home for the sake of preserving one’s health?! I’m remembering how the desert around my city once was considered the haven for those who had allergies, doctors often recommending an extended visit or residency here for health reasons. Decades ago, it was less developed and there were fewer species and fewer quantities of those specimens to bother the average allergy sufferer or those with breathing issues. But with the post-war, mid-century population surges of the 20th century, this desert city became a thriving metropolis! Along with all that growth and development came waterways, greenbelts, and many more gardens with more varieties of plants! Now, this desert town has become a beautiful expansive oasis, but the prevalence of allergies are a tell-tale symptom of our progress! We even recently developed a mosquito issue, due to our regular rains and the prevalence of water in communities! Although I feel truly sorry for those inflicted by the symptoms of such fabulous blooming seasons as this one, I am thrilled to experience it for myself! It’s amazing the depth, breadth, and scope of natural beauty found in a desert after ample rain! Suddenly, even the harshest terrain can resemble something entirely different and much softer for all the moisture. Bright greens and hues which defy description have replaced the browns and tans the desert normally wears! This change of costume for our desert is a perfect way to delineate the transition from Spring into Summer! As one scene ends with one season, another begins, and the star of the show has a wardrobe change to highlight that transformation! I’m sure the allergy sufferers will take their relief shortly when the heat of Summer blasts the blooms into submission. It’s just around the corner now that we’re in April! Even the hardiest of blooms takes a pause for the intense heat, drought, and sun of Summer in our desert which usually is advancing by May. I will savor the moments I now have to enjoy the beauty we’re experiencing by spending time out in my garden and in nature! It’s a beautiful season, a fabulous year, and there is much in the way of God’s majestic design and craftsmanship to behold! And I’ll surely appreciate doing so sans allergies and breathing issues, and be thankful in the process! Unwelcome Wind, Refreshing Rain . .
Just about the time I was going to complain about the winds which had picked up this evening, I noticed the fresh scent of rain in the air wafting in through the open window. I went outside to check, to my own disbelief, it was in fact, raining lightly upon me and all the world around me! Those winds were worthwhile as they surely brought with them those few moments of bliss in the form of a stormy weather cell! And that’s a lesson for life. Often what we endure brings us a reward, a lesson, or some result which is beneficial! Those winds enabled us to have the fresh, clean scent of rain falling. And even though the rain only lasted for a short while, it was delightful! In studying life, don’t we often find that what we endure produces some beneficial lesson or experience from which we can gain something positive? Even in the worst case scenario of death, loss, illness or some other tragedy, there are positives hidden amongst the seeming perils, hardships, stones and thorns. We just have to look for the hidden treasure of a benefit to reshape what we perceive as negative into something positive instead! And we can utilize this trick for small difficulties and significant problems equally. I had started out by being annoyed by the wind picking up, as I had just finished creating two big piles of plant trimmings near the sidewalk out front. We have scheduled uncontained trash pickups every quarter, which enables us to put out plant trimmings as well as a lot of other items which won’t fit in our garbage cans. It’s a benefit our city offers, scheduled by the area of the city in which we live. In my area, we’re preparing for our pickup next week. So I was able to do a lot of Spring yard clean up in anticipation of this particular quarter’s uncontained trash pickup. The piles I made contain mostly pruned branches and assorted cuttings from plants in my yard. There are two piles of limbs, branches, as well as several trash bags filled with leaves. Unfortunately, the wind means my piles might blow around or shift from their present location! 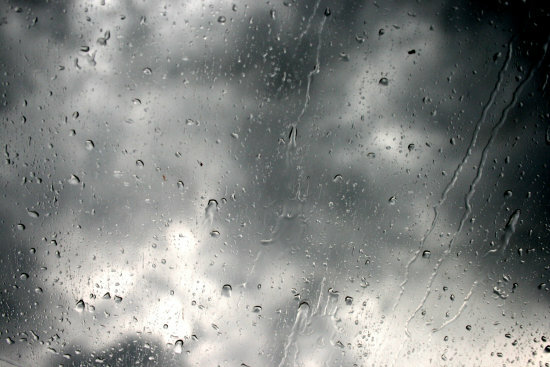 So I became a bit agitated at the thought of the mess I might have until I smelled the rain through the breeze that is! And now as I’m reflecting upon the change the winds brought, I can even still hear the thunder clapping outside a few hours later! It’s a pleasant surprise from what began first as an annoyance. The wind wasn’t entirely welcome, but along with it, was this storm cell offering up scents, sounds, and a refreshing change! I’ve learned to look for the benefit in things, in even the worst case situations in life. There is always something positive and beneficial to be found in everything, even in tragedy or great sadness or in our problems! It might require significant, heartfelt searching to find that benefit or to see the positive in something seemingly or overwhelmingly negative, but to do so ensures that we’ll have more joy and/or contentment in life! Instead of making ourselves miserable, especially over things we cannot change, we create more joy or at least don’t destroy our existing joy! The wind was threatening after so much work creating those piles, after all, I worked hard to rake up leaves, bag them, cut branches off trees, then move it and stack it all at that spot in my yard near the street. But without the wind, I wouldn’t have had the rain tonight! So I welcomed the wind because it brought the rain and stormy weather. Often, without the negativity or the pain in life, we wouldn’t know how to truly value the blessings we have! Learning how to see life through rosier lenses is a gift for sure! It just takes looking past what at first seems to be less than rosy, positive or promising! Shift your focus and you’ll see everything differently, from a new perspective. Home On Sunday . . Being missed is a truly special sensation to experience! Last week, I was traveling out-of-state so I missed going to church. I go to the same service at the church of which I am a member every week here in my city unless I am ill or traveling. Otherwise, I am there, in my normal pew every week a few minutes before the service begins. I sit in front of a lovely couple, and behind a row of senior citizens who all live in the same adult community. All around me are familiar and friendly faces, also in their usual seats. It’s a community, our church. We know one another, even if not readily by name so far; we greet one another and keep track of one another. We smile, we hug, we wave, we check in, we weep, we comfort, we console, we encourage, we pray, and we take notice of absences and new attendees. So when entering church today, there were avid greetings and “glad to see you”s. It felt good to be missed last week, to have people who not only noticed my absence but also who welcomed me back! A few years ago I was prompted to find a church home. I had wandered about looking for a place in which I could feel welcomed and where I could grow spiritually and deepen my relationship with the Lord. So I decided one Sunday to attend this church as a visitor but never looked elsewhere after that first time! From that first day, I was warmly greeted and people took a genuine interest in me. And so it has been ever since! Every week I am there provides me with what I would appraise as the best moments of my week! I walk through the doors and my spirit is elevated with joy! The Holy Spirit dwells in that building, in all the souls which frequent that church and in the ministry staff which leads us all. It’s an amazing place! I cannot say if that is the same experience everyone who is a member or visitor has. It is mine, perhaps mine alone, although I sincerely doubt it! I am sure many others must have felt that amazing connection and bonds which develop within the walls of our sanctuary and on the premises. And those same connecting bonds are also found in other locations where members unite in ministry or just for fun. It’s not just the building, it’s something which lives there within the buildings! It’s a spirit, an in-dwelling, a community with a calling from the Lord. It’s God’s love pouring out in worship, prayer, song, gatherings of all sorts, and through relationships forged often over the entire lifespan of the church! All my life I’ve either gone to churches of the same denomination or of other Christian denominations, looking for what I discovered on that fateful Sunday. In all those years prior, I never felt the same sense of what I’ve discovered at this church! I never knew that I had been missing the depth of experience which I’ve found there! I discovered Spirit-led people involved in something meaningful, with purpose and with love. There is love, there is compassion, there are relationships built on God’s love and committed to sharing it with others! When anyone is hurting, there are others who enfold them with love and take a share of the burden. When someone needs counsel, there are people trained to help advise and guide. When prayer is needed, there are hundreds of prayer warriors who lift those souls and prayers to the Lord. When the community needs support, there are plentiful hands to help, to give, to provide and to offer. The Spirit leads and by Christ’s example, it is done. This church is so special I decided to become a member within the first year, taking classes and making the commitment before the congregation later that year! Finding such a great home on Sunday has also encouraged me to stretch beyond what I absorb only on Sundays! I attend Bible study and seek out other events whenever possible during the week. 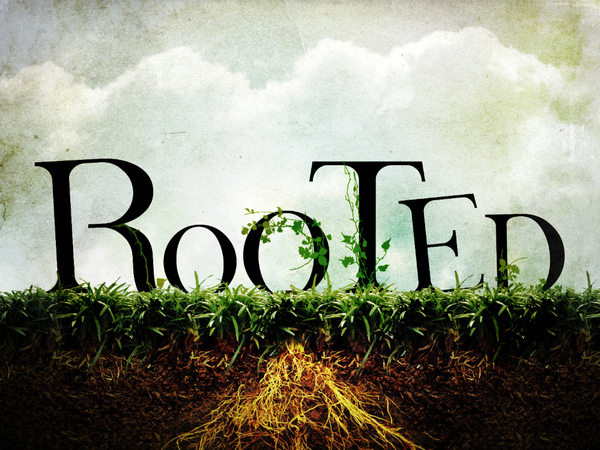 It’s a great place to connect, and those connections benefit not only church members but all those in the neighboring community and in distant locations partaking of our ministry outreach! And so this morning, I received such warmth and love, especially after having been gone just one week. It’s wonderful to be missed, to be meaningful in the lives of others and to meld into a large community which truly feels like an extended family! I encourage everyone who frequents church to seek a church home which is so welcoming and actually befits the embodiment of that word “home”! Home is a special place. It is where a heart finds solace, comfort, acceptance and companionship. Home is where love flows. My church home draws me each week because I look forward to worshipping the Lord and being with my loved ones! Each week, I am welcomed home!